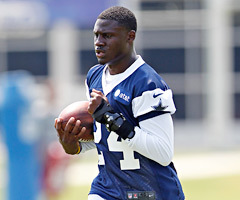 Published: July 23, 2012 at 03:36 p.m.
Dallas Cowboys cornerback Morris Claiborne missed practices throughout the offseason because of his wrist injury. He won't miss any practices in training camp because of his contract. The Cowboys' official website later confirmed the deal and said Claiborne's fully guaranteed contract includes a $10.3 million signing bonus.